I was recently introduced to Fiverr.com, a website where people offer their services for only $5.00. What services you ask? Almost anything you can imagine (within expected business and Internet services). I was directed to Fiverr.com to find someone who could create several backlinks for a project. Backlinks take people from someone else on the Internet to your webpage. However, once I started exploring the website I was intrigued. Fiverr.com offers services in six different areas, listed below along with the subcategories of services. Each basic service, referred to as a "gig," costs $5.00. Each offer also includes enhancements, called "gig extras." Gig extras cost additional money. 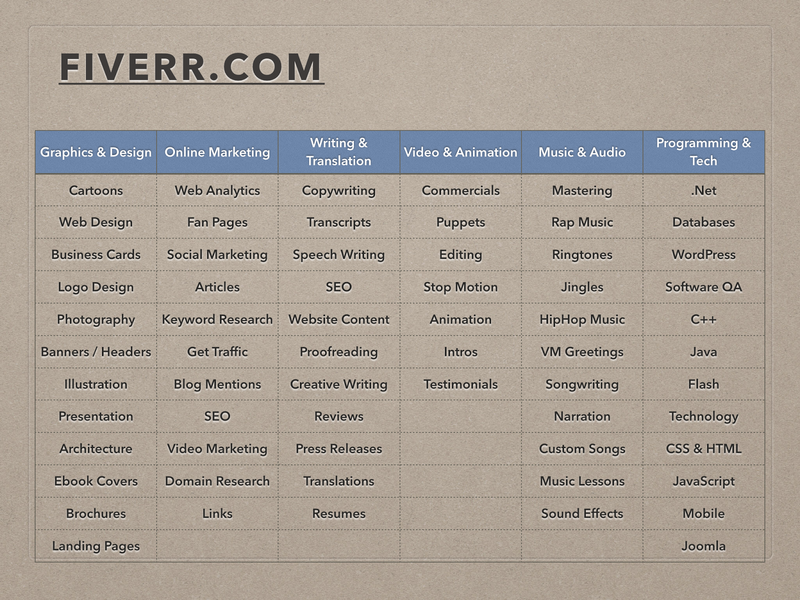 Each purveyor of services on Fiverr.com has a webpage with all of the various gigs that are available. You can search by category of gig (see list above) or, once you have viewed information about a gig, see what other gigs a Fiverr is offering. The average number of days to complete and the number of order in queue are listed for each gig. One category of gigs that I found interesting are the Online Marketing and Video. There are many Fiverrs who offer to make a video promoting products or providing a fake product testimonial. www.PersonalChange.info is a blog website created by Douglas G Pratt to help you "become more." When you visit www.PersonalChange.info be sure to subscribe by e-mail. Four days later, Mike sent the video. I added a background and decided to shorten the video. I will definitely be using Fiverr.com from time to time to take advantage of different services. Have you tried any services offered on Fiverr? If so what did you think? If you liked this post please comment below and share on Facebook.